“As in your previous book, The Old Buzzard, you show the old western farm in the change-over from the horse and buggy days to the new-fangled automobile, in an up and coming Oklahoma country where those farms stretched for miles and many people only knew their neighbors slightly. The towns that grew up around those outposts were involved in the growing of this country and the people becoming more socially oriented towards each other, playing a part in the relationships shown. You had to have listened attentively to a grandmother or other older family member tales of that time (which you have also clearly researched extensively) to make the reader feel totally at home in the middle of it. I even started thinking and speaking in the Oklahoman dialects that I remember so well from my past relatives. To make a murder that took place in a community so remote from today’s hustle and bustle, amidst that of the simple life of nearly a 100 years ago, really is a remarkable achievement, seeing as how most people only relate to present time circumstances with any fluidity. I completely and honestly recommend Hornswoggled as a book the reader will feel completely at home in reading, in part because ther is so much in it that is inside all of us and makes us the people we are today. 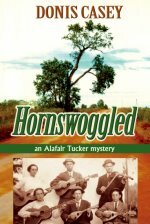 “Author Donis Casey has featured her unusual, crime-solver heroine Alafair Tucker in two novels, now, and with Hornswoggled…we can only be glad to see her back. Alafair doesn’t like him; most mothers would be suspicious of the too-smooth charmer. But for Alice’s sake … Alafair sets out to find the real killer, even if it is the man her daughter loves … In a little town where eveyone knows everything — there are many secrets no one seems to know. This series is everything a 20th-century-historical mystery series should be, and if the rest of it is as awesome as the first two books, I will be so very happy. Community Live Page, 50 Book Challenge, www.community.livejournal.com, March 21, 2009. Alafair is not happy at all when her daughter Alice becomes enamored of the newly widowed Walter Kelley. He was cleared of his wife’s murder, but something doesn’t sit right with Alafair. When her children are involved, Alafair Tucker leaves no stone unturned.